A good diet starts with a healthy breakfast. Your muscle and brain function suffer when you don’t replenish your body with nutrients after a night of sleep. You’re also more likely to overeat at lunchtime. The U.S. Department of Agriculture suggests choosing foods from all the food groups at every meal. Eat right by working whole grains, fruits, vegetables, low-fat proteins, nuts and seeds into your breakfast meal. Start with a more healthful entree, such as a whole-wheat bagel spread with almond butter, versus French toast made with white bread. How much you eat is as important as which foods go into a healthy breakfast. Even nutritious whole-grain cereal can be overeaten. 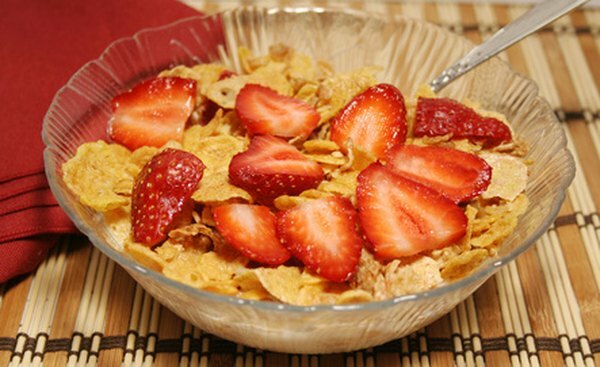 If you tend to gobble your favorite cereal, the Centers for Disease Control and Prevention recommends trimming your portion size and adding cut fruit to fill your bowl. Shape Up, America! offers these more specific guidelines for a good diet: Choose cereal with 4 grams of fiber per serving; follow the portion size recommendation on the box; and keep your total calories (including milk, fruit and nuts) to under 150. You’ll still eat right, but you'll feel fuller and take in fewer calories. Break the habit of sprinkling refined sugar on your cereal or grapefruit. Many health experts, including the American Heart Association, suggest honey or maple syrup, whose concentrated flavors allow you to use less. Drizzle honey or pure maple syrup over oatmeal or a piece of whole wheat toast. Note that brown sugar is not considered a healthier substitute for white sugar, as reported by "The New York Times." For a healthy breakfast on the go, get a wide range of vitamins and minerals from a fruit smoothie. The National Institutes of Health suggests a blend of frozen fruit, yogurt and a little juice or fat-free milk. Toss ripening bananas in the freezer to keep on hand for this quick meal; thaw briefly and puree. Vegetables are an essential component to a healthy diet that help you eat right in the morning. They contain fiber, vitamins A and C, calcium, iron, potassium and important antioxidants. The CDC suggests this nutritional boost for the usual cheese omelet: substitute vegetables for one egg or half the cheese you usually use. Choose nutritious spinach, mushrooms, broccoli onions or tomatoes. When cereal and milk doesn’t appeal to you, eat right by finding other sources of low-fat protein, fiber, vitamins and minerals in your fridge. The ADA offers these creative breakfast examples: rice pudding made with low-fat yogurt, leftover rice and dried fruit and nuts; a tortilla wrap with deli turkey, low-fat cheese and crunchy lettuce; and leftover pizza with vegetable toppings.